Let me tell you a story about turning 40 years old. Of course it's only a number, but for me it was an unpleasant psychological milestone - a reminder of one's mortality and disappearing youth. When I celebrated my 39th I heard all the usual comments about how I had only one more year before I began to fall apart, etc. So I resolved to be ready - to steel my mind to the coming catastrophe - to anticipate all the external and internal negative shrapnel that would be hurled my way. I prepared so well, in fact, that when my 40th birthday came it was a complete non-event. It didn't phase me in the slightest. Then I turned 41. OMG you have to keep going! It hit me like a ton of bricks, feces to the fan, use whatever metaphor you prefer. All my preparation for turning 40 was for naught. My 41st birthday devastated me - the hardest birthday I've ever had. 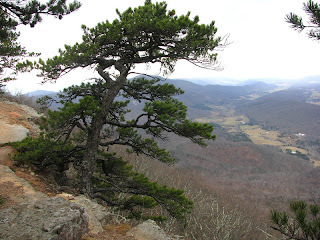 (Of course, now I'm 63, and beginning to turn that corner toward being proud to have made it this far, but that's a chapter for much later in this Appalachian Trail saga). But the theme of today's chapter is: all the prep work and hype that led to a joyous Day 1 has come and gone. Now it's Day 2, and I'm realizing 'You just have to keep going'. This little monkey is a marathon, not a sprint. All the mental and physical preparation you do beforehand goes out the window and you're faced with the 'boots on the ground' reality of getting up every morning and slogging up the trail. It's always harder on Day 2 anyhow - just because your body took a beating on Day 1. But I had that experience of '40th birthday, take 2' to fall back on, so when that sinking realization hit me - of the enormity of the task ahead - I was ready with my response. There's another great thing about being 63 - the perspective you've gained from accumulated experience. So all-in-all I managed to enjoy today. And what's not to enjoy! The scenery was spectacular again as I traversed Tinker Cliffs. The photo at left shows the Catawba Valley from said cliffs, looking south toward McAfee Knob (which you can glimpse behind the picturesque Virgina pine). As had been forecast, the weather turned bitter cold today - never got above freezing, and the wind howled, especially on the west facing rim of the Cliffs. I broke out all my mountaineering gear and was entirely comfortable, even when snow squalls moved through in the afternoon. I hiked only 11 miles today, but with a lot of long ups and downs it felt harder than yesterday's 17.5 miles. Today's snow was only a dusting, but tonight there are some heavier squalls moving through and we already have a half inch as I write this. Any accumulation makes footing more treacherous and will slow me down. But that's tomorrow's tale - and an interesting tale it should be, if I have any say in the matter.